I was in Europe for a couple of weeks earlier in March. Justine joined me for the last week of the trip, and I will update the site with some new posts as I have time to get through the photos and process everything. It was a fun trip, so it will take a bit of time to get them done. In the meantime, it had been over a month since we were last over to the island to see the property. 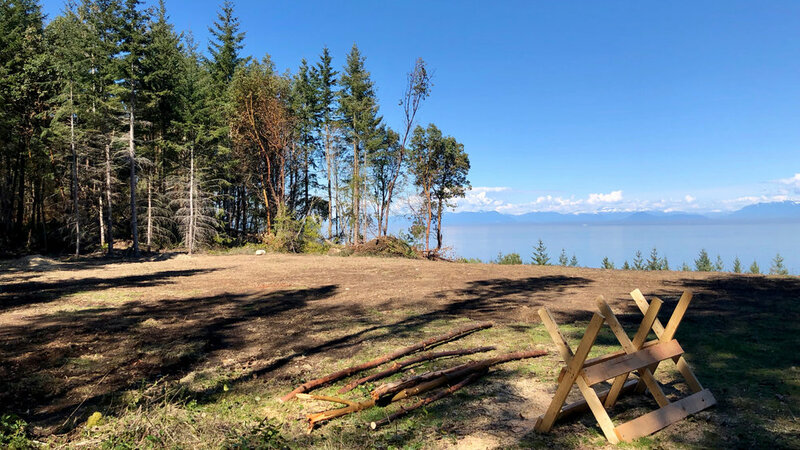 The (relatively speaking) harsh winter had put most of our plans on hold, but the contractors we were working with finally were able to start work on our utility building project and some landscaping work. We were anxious to see what progress had been made. It was a gorgeous day, as we watched a different ferry heading into active pass, from the Salish Orca. After arriving on the island, we made our customary stop at the bakery for a treat and to grab some lunch for later. The plan was to do some works around the property, and to see the progress that had been made. We drove up, curious to see what had transpired in our absence! There were two projects on the go. The main one is the utility building that we need to hook up power and house all the infrastructure for our well water treatment and pumping. Once that’s done we can have BC Hydro bring in power, and get the water situation sorted out. That will make the place somewhat liveable. Myron is looking after that one for us. For the second one, we had asked the local excavation contractor (Fred) to do a bit of sculpting of the land. We got the invoice for that one, so we were very curious to see what was done. And on both counts, our expectations have been exceeded. Our utility building, mostly complete but still a bit of a work in progress. The original plan had been for a 10’ x 10’ utility building, built to last for the rest of our lives really. 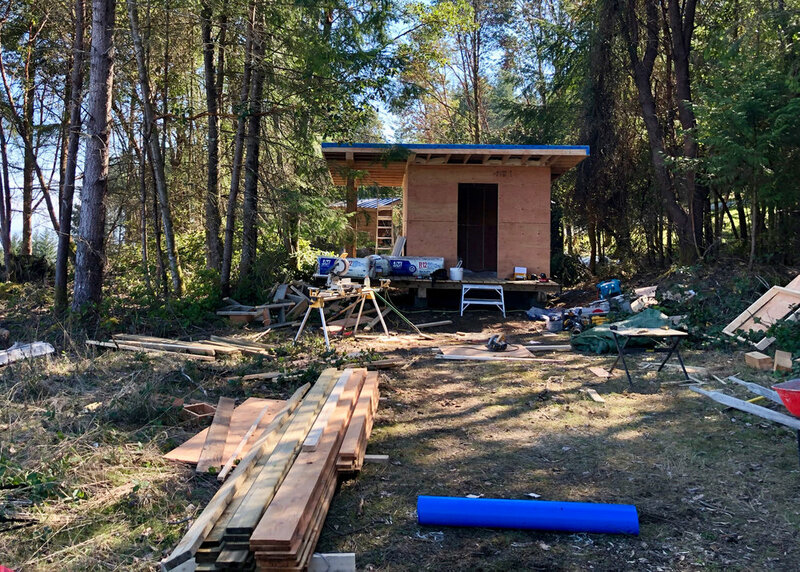 We’re putting all the infrastructure into it, with the plans to run to both the cottage and eventually the house, as our time on the island progresses. So I asked for proper poured concrete footings, fully insulated and the like. As we talked about it, I also asked him to add a deck around the outside so I could have a bit of level working space. The roof overhang was all Myron - it’s fantastic, and I’m sure we’ll appreciate it in the rain come winter. We’re excited to get it done - we’ve got a ton of stuff we need to bring over that’s cluttering our storage locker. Next up was Fred’s work cleaning up the property, and again, the results were more than we had expected. He leveled off and scraped the top part of the property, giving us a great open, flat space to work with. Along the back (front?) 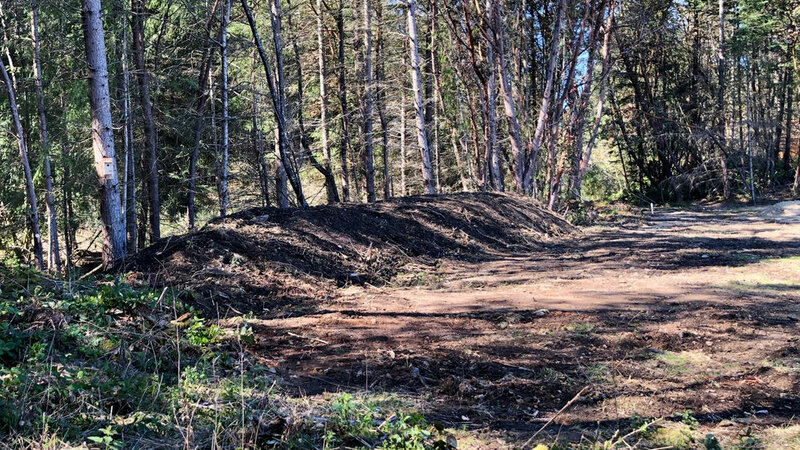 of the level top portion, the dirt he scraped all ended up as this great mound, giving some separation from the forest and small ditch/ravine between us and the road. After stopping for lunch, we wrapped things up. We installed a birdhouse on one of the trees and headed down to the beach. The little beach near the bottom of our property is always worth a trip. This time, strangely, there were people there. That almost never happens! They were all leaving as we were walking down, so that left us with the beach to ourselves. It was pretty quite - no otters this time, and not a lot of birds. I guess the migration back north is mostly underway. Still there were lots of seals, checking us out from just offshore. 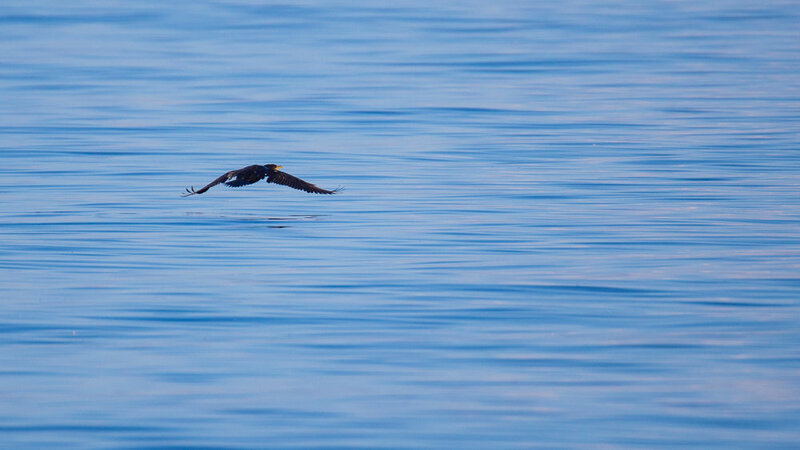 There were 11 or 12 harbour seals hanging about. After hanging out on our beach for a bit, we headed back down to the south end of the island. We had a bit of time before we needed to catch the ferry, so we went over to one of the shore access points. 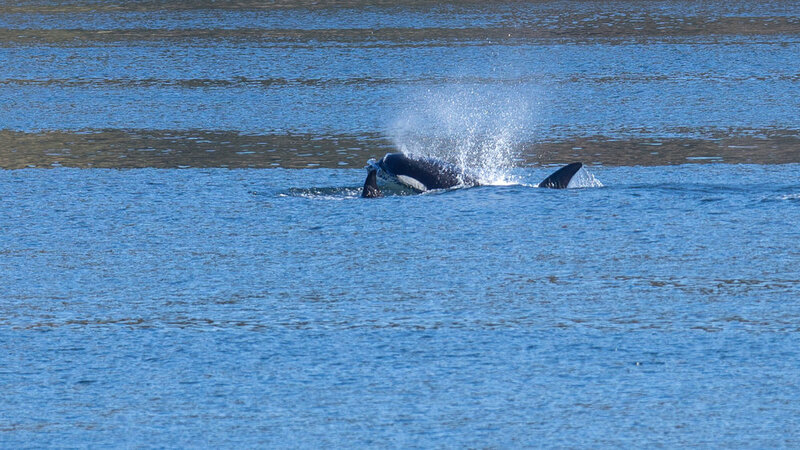 We’ve had good luck at this spot - seals, sea lions, pileated woodpeckers and of course orcas when we were there with our friends Stuart and Jo and Sova. 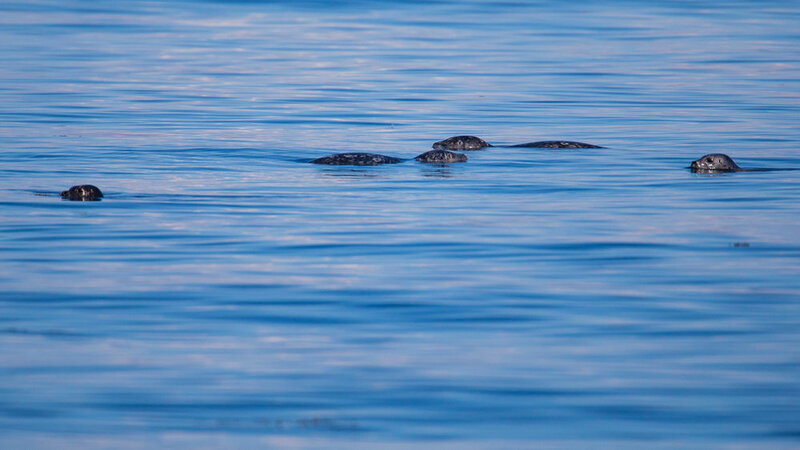 Justine noticed a few sea lions cavorting out in Active Pass. 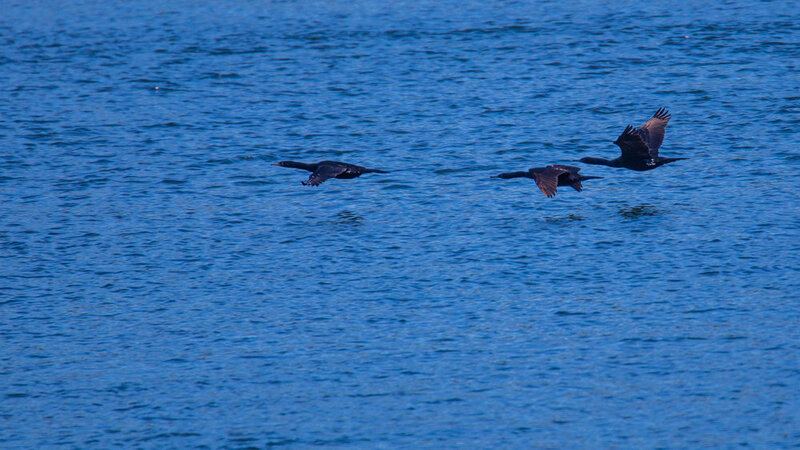 Pelagic Cormorants flying through Active Pass. 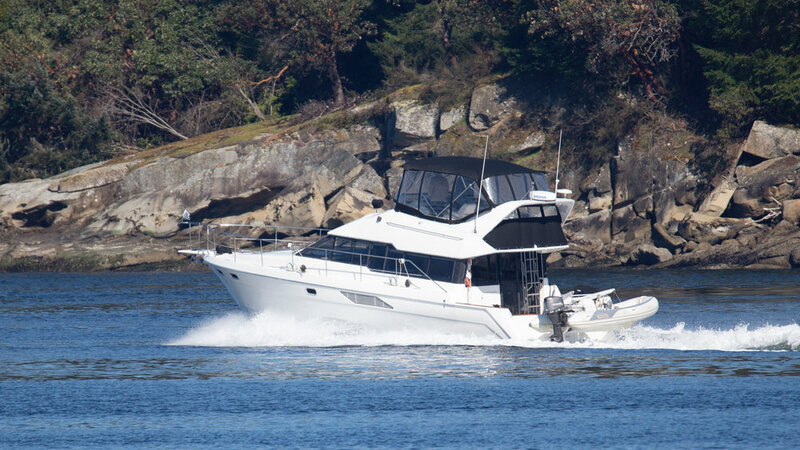 Overall, it was pretty quiet, and we were about to head out when I noticed a whale watching boat head into Active Pass from the main channel. 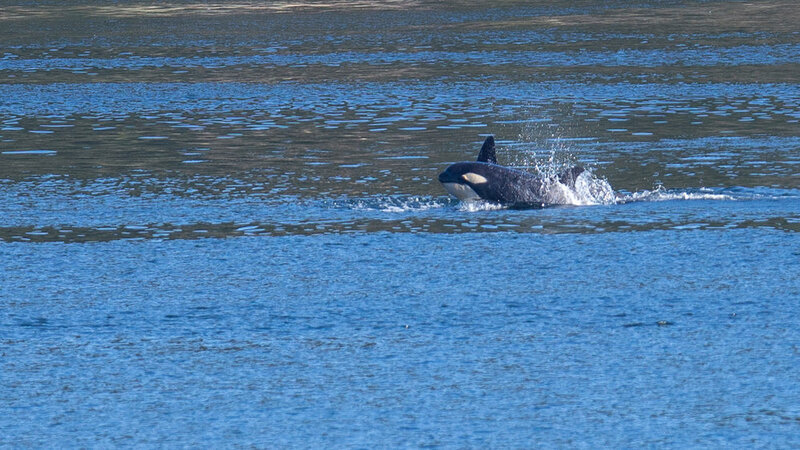 That’s always a good sign so we stayed put and were rewarded a few minutes later with a small pod of orcas! There were 5-6 of them (not completely sure how many), including one small one! 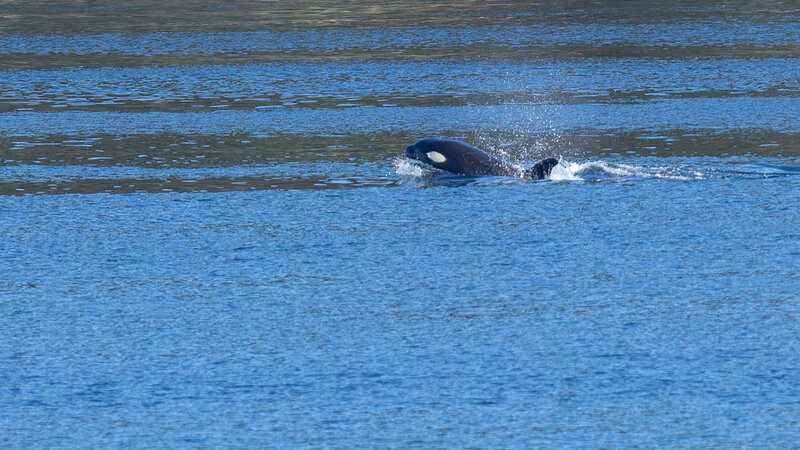 We were having a great time watching them, until some jackass in a boat drove full speed right through where the whales where! Did not even slow down. At that point, not surprisingly, we lost them. I tried to zoom in on the boat and get a name, but it was blocked off. I could only see that it was registered in Victoria. We did spot the whales way off in the distance after a little while. The little pod of orcas heading out into the distance. After that fun sighting, we headed back to the ferry and parked the car. We went over to one of the local restaurants and had some food, then headed home. Sunday, was another amazing day and we spent most of it getting the roof deck cleaned up after the winter and all set up. We’re ready for summer! We spent Sunday afternoon getting organized on the roof. The roof deck all set up and ready to go! Sunday night we had an amazing sunset, and the city looked beautiful.